Rowan Atkinson may have more than 50 acting credits on his resume, but to most of the world he’ll always be best known as the ridiculously rubber-faced Mr. Bean. As the iconic British comedy series celebrates its 25th anniversary (complete with a newly remastered DVD set from Shout! Factory), we uncovered 15 things you might not know about Mr. Bean. 1. 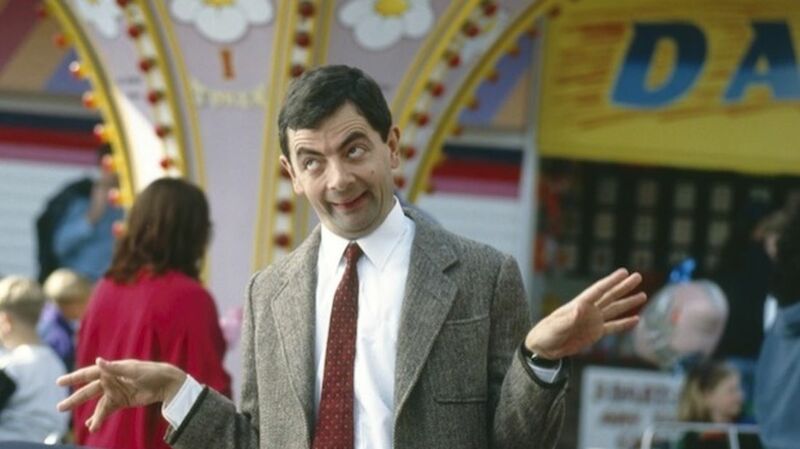 MR. BEAN BEGAN LIFE ON THE STAGE. 2. ONLY 14 EPISODES WERE EVER PRODUCED. Even the most dedicated fans have trouble reconciling the fact that only 14 episodes of the live-action series were ever produced. It did, of course, spawn two movies, an animated series (which returned to British television earlier this year), a video game, and some books, including Mr. Bean’s Definitive and Extremely Marvelous Guide to France. 3. THE SERIES WAS BROADCAST IN NEARLY 200 COUNTRIES AROUND THE WORLD. Because the bulk of the comedy is physical, not narrative, Mr. Bean has not gotten lost in translation. “There doesn’t seem to be a country in the world, or not that I have visited, or indeed none that I have heard of, who don't seem to get him, who don’t seem to understand and enjoy the character of Mr. Bean,” Atkinson told ABC. “I think, and I’ve always assumed, it’s because he’s basically a child trapped in a man’s body." 4. ATKINSON HAS FAITH IN HIS FACE. 5. THE GUY WHO DIRECTED LOVE ACTUALLY DEVELOPED THE CHARACTER WITH ATKINSON. 6. ATKINSON WAS INSPIRED BY JACQUES TATI. 7. MR. BEAN DOESN’T SPEAK IN FRENCH EITHER. Before he made his small-screen debut, Atkinson tried out the Mr. Bean character on the audience at the Just For Laughs festival in Montreal, Quebec. In order to ensure that the character’s near-silent comedy would translate, he requested to perform for a French-speaking audience as opposed to the English-speaking attendees. 8. HE COULD HAVE BEEN NAMED AFTER ANOTHER VEGETABLE. It wasn’t until shortly before Mr. Bean hit the airwaves (and after production had already begun) that the character actually got his name. Originally, he was going to be called Mr. White. Then the show’s creators began throwing around some vegetable names, and considered Mr. Cauliflower before deciding on Mr. Bean. 9. MR. BEAN IS THE MAN WHO LIKES TOILETS. Mr. Bean doesn’t speak often, but when he does the voice he uses is the same one Atkinson used to voice “The Man Who Likes Toilets” sketch on Not the Nine O’Clock News. 10. ATKINSON THINKS MR. BEAN IS AN ANARCHIST. 11. YES, HE REALLY CAN WIGGLE HIS EARS. 12. MR. BEAN PERFORMED AT THE OLYMPICS. 13. ATKINSON RETIRED THE ROLE IN LATE 2012. 14. IN 2015, BEAN ROSE AGAIN—FOR A FUNERAL. Never say never: On March 13, 2015 a brand-new Mr. Bean sketch, “The Funeral,” premiered to celebrate Comic Relief, and in honor of Bean’s 25th anniversary. 15. MR. BEAN’S CREATORS COULD NOT HAVE PREDICTED ITS SUCCESS.